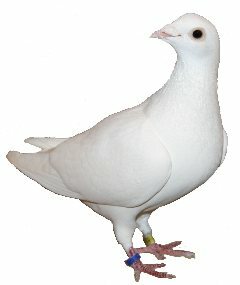 Since we are starting many new clients in the White Dove Release Business, we feel we must give some simple instructions on how to successfully raise these birds and keep them healthy. All orders shipped will include some simple copyrighted instructions for you to follow. Please follow them!!! Keep Your New Birds Alive! These birds are only 40-45 days old when we ship them. It is essential that these birds have easy access to their feed and water in the new loft as soon as you receive them. We feed our birds with a scientifically developed formula called Racing Pigeon Essentials. This improves the overall health of the young birds we sell. To learn more about Racing Pigeon Essentials, and what it can do to increase and improve the overall health of your young and old birds, please visit the link on our home page. We also are one of the first to give all our birds magnetite, which research has proven to increase the birds' homing ability. We now sell magnetite due to its popular demand. You can buy these products on our Supplements & Release Supplies pages. Please visit our Product Catalog.